The passport was discovered by a judge in a musty court storage room. A local judge found the documents locked away in a storage box in Argentina. 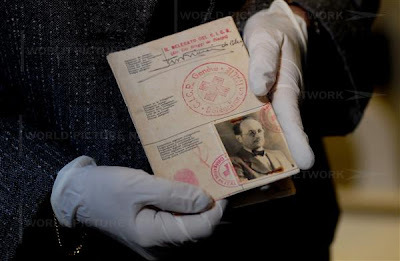 The Red Cross passport which enabled Nazi war criminal Adolf Eichmann to flee Europe for South America in 1950 has been discovered by chance in a court file in Argentina. The well-preserved document is in Eichmann’s assumed name of Ricardo Klement, under which he lived for ten years in Buenos Aires, fathering a fourth son and working variously as a rabbit farmer, a water engineer and a foreman at a Mercedes Benz factory. The photograph, however, is of Eichmann, the SS officer who took the official record of the Wannsee conference at which Germany’s Nazi leaders decided on the “final solution” for the Jews. The passport has remained in Argentina, locked away and forgotten in a musty court storage room, until it was found by Maria Servini de Cubria, a federal judge who decided to have a look at the Eichmann file. I am not sure if you are aware of the history of Eichmann and the Redcross, so I will share. A Swiss fellow by the name of Francois Genoud was a right hand man/admirer of Hitler and the Grand Mufti during WWII. Francois Genoud was instructed to run with the financing and aid of the Grand Mufti any time after Hitler was removed from the scene. The Nazi Socialist Movement was to move into the Middle East with the new movement of Islamization. The Grand Mufti was made a Nazi General and in charge of his Muslim converts into the Nazi Army under the Waffen SS Divisions. After WWII Francois Genoud was made president of the Swiss Red Cross. It was through this position that he was able to obtain identification documents and passports to allow a lot of the Nazi leaders to escape. After Eichmann was captured it was Francois Genoud that used his money (possibly Nazi money) for the legal defense of Eichmann and many others that would stand trial including Klaus Barbie. Of course the Grand Mufti never was held responsible for his actions and he raised his nephew Yasser Arafat to take over the Nazi/Islamic movement. Francois Genoud’s participation with that passport should be further researched and reported, i.e. how he did it?, who he used?, is there a direct paper trail?, are there others that could be implemented?, was this passport kept put away until now for a reason? In addition, Francois Genoud’s participation with the continuance of Hitlers ideologies should be broadly reported and moved into the MSM. It is usually kept rather silent. Interestingly, Francois Genoud did have very coincidental crossings after WWII with another fellow European that helped the Nazi’s by the name of George Soros, and that is a whole other story to look into. The information on Genoud goes on and on. The fact that there have been no major books written on this guy is shocking.